"An air strike on a Scud missile base in the Houthi-controlled Yemeni capital Sanaa triggered a big explosion that killed 25 people and wounded almost 400 on Monday, state news agency Saba said.Saudi Arabia has led an alliance of Sunni Arab countries in air strikes against the Iran-allied Shi'ite Houthi group and army units loyal to ex-president Ali Abdullah Saleh." - Reuters. The video grab on the right hand side depicts the massive bombing by Saudi forces on 20th April 2015 at Faj Attan Scud Missile Facility near Hadda Diplomatic Zone in Sa'naa. 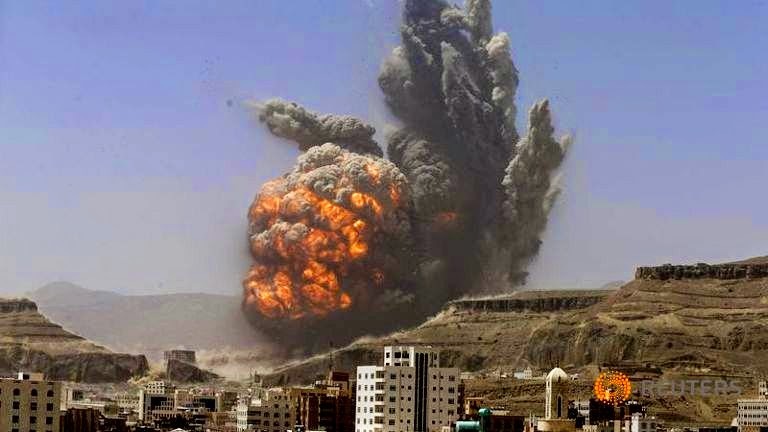 Local residents claimed that the particular air raid was the largest explosion in more than three weeks of bombing by the Saudi-led coalition. The blast hit the base on Faj Attan mountain beside the Hadda district, home to the presidential palace and many embassies, blowing out the windows of homes for kilometers around and sending a tall mushroom cloud into the air. As per Saudi military spokesperson, The next phase will focus on the movements of militias, protection of civilians, and support the evacuation and relief," he added, in an announcement that suggested over three weeks of pounding military bases across the country had run its course.Al Jazeera's Mohamed Vall, reporting from Jizan near the Yemen-Saudi border, said Riyadh may have targeted the base over fears that Houthi fighters could use scud missiles at the base to target the kingdom. "The Saudis are afraid that if these missiles are taken near the border they will inflict damage there." / "If modified they [scud missiles] can reach hundreds of kilometres in distance," he said.